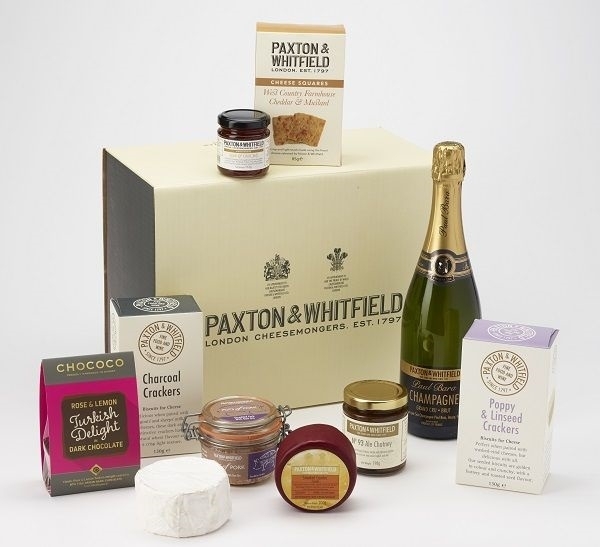 Here at Paxton & Whitfield, we’re famous for our luxury Christmas cheese hampers and this year we have another stunning collection which we know you will enjoy. As well as firm favourites such as The Belgravia and The Piccadilly, you can choose Boxing Day Delights, a glorious selection of cheese and fine food, perfect for the festive season. Plus, we’ve created a fabulous gluten-free cheese hamper containing a delicious mix cheese and fine food delights. And you must take a look at The Ultimate Paxton’s Collection luxury cheese hamper, a truly extraordinary gift to give this Christmas. 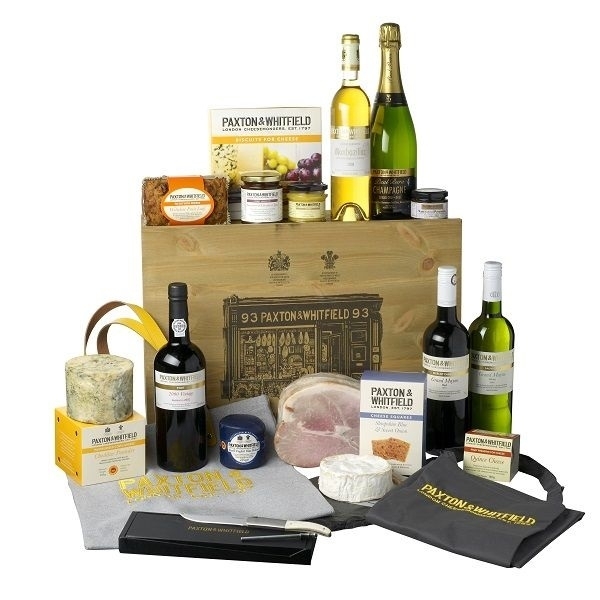 A decadent gift hamper that embodies the Paxton & Whitfield passion for exceptional cheese, fine food and wine, all presented in two large branded wooden hamper boxes. 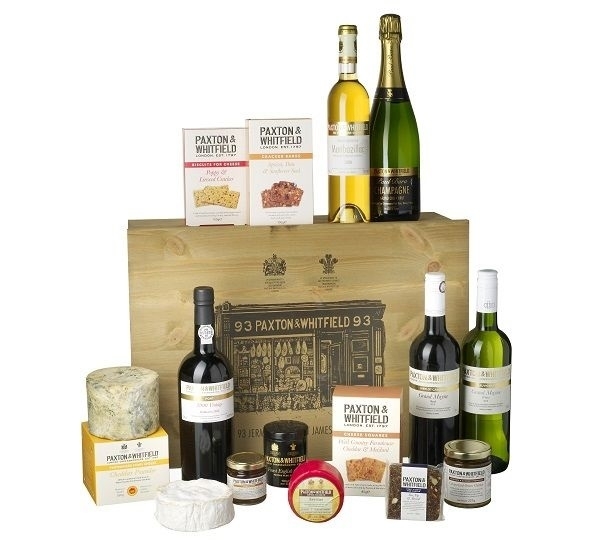 This stunning cheese hamper contains: Côtes de Duras White, Côtes de Duras Red, Monbazillac, Champagne Grand Cru, Paxton’s Vintage Port, Multiseed & Pepper Cracker Bakes, Apricot, Date & Sunflower Seed Cracker Bakes, Cheddar & Mustard Cheese Squares, Shropshire Blue & Onion Cheese Squares, Biscuits for Cheese, Paxton & Whitfield Platter and Glass Dome, 7 Piece Cheese Knife Set Wood, Stilton Jar, Classic Shredded Pork, Shredded Pork with Sloe Gin, Half Wiltshire Ham, Fig Ball, Wiltshire Fruit Loaf, White Fig Confit, Apricot & Orange Confit, Quince and Apple Confit, Pear & Vanilla Confit, Cheese Curler and Cover, Tete de Moine, Baby Stilton, Brie de Melun, Cheddar Truckle PDO, No 93 Chutney Orcio Jar, Really Proper Piccalilli Orcio Jar, 100yr Balsamic Vinegar, White Truffle Oil, White Truffle Honey and Minced Black Truffle. 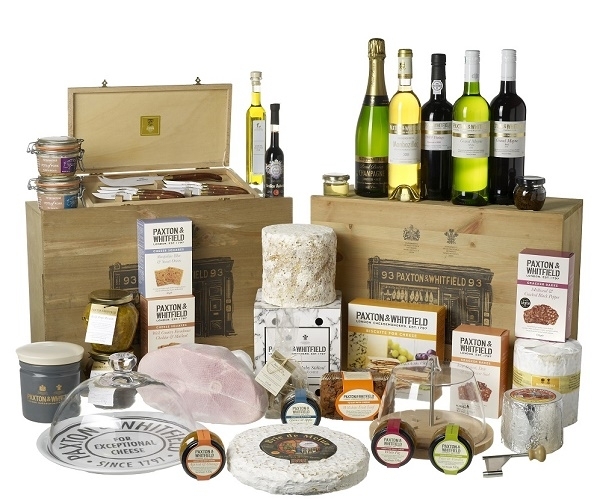 A delicious selection of artisan cheese and fine food treats for the festive season. This cheese hamper contains: Charcoal Crackers,Cheddar & Mustard Cheese Squares, Apple & Chilli Jelly, Celtic Soft, Smoked Ceodre, No93 Ale Chutney, Mini Waxed Stilton PDO, Poppy & Linseed, Chocolate Covered Turkish Delight and Paxton & Whitfield Champagne. 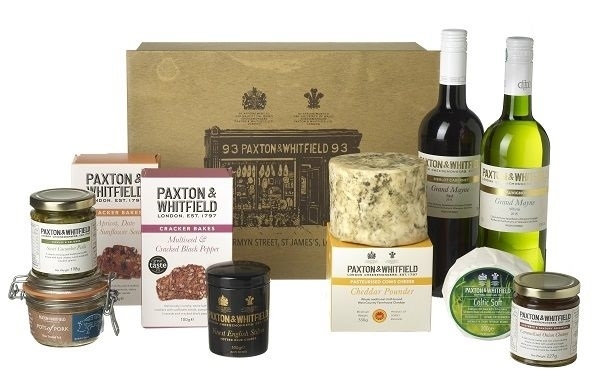 A sumptuous gift of Paxton & Whitfield cheeses, wine and accompaniments, with all contents free from gluten, presented in a branded wooden hamper box. Multi-seed & Cracked Black Pepper Cracker Bakes, Apricot, Date and Sunflower Seed Cracker Bakes, Fig Ball, Cheddar Pounder PDO, Stilton Jar, Celtic Soft, Classic Shredded Pork, Caramelised Onion Chutney, Sweet Cucumber Pickle, Côtes de Duras White and Côtes de Duras Red. A delightful selection presented in a large wooden hamper box. For a truly indulgent gift, this cheese hamper features artisan cheese, fine food and five bottles of wine. Open it and you’ll find: Cheddar Pounder PDO, Stilton Jar PDO, Camembert de Normandie PDO, Dorset Goat, Classic Shredded Pork, Wiltshire Fruit Loaf, Rosemary Wafers, Multi-seed & Cracked Black Pepper Cracker Bakes, Shropshire Blue & Onion Cheese Squares, Nuts about Prunes, White Fig Confit, Sweet Cucumber Pickle, Côtes de Duras White, Côtes de Duras Red, Monbazillac, Paxton’s Vintage Port, Champagne Grand Cru.